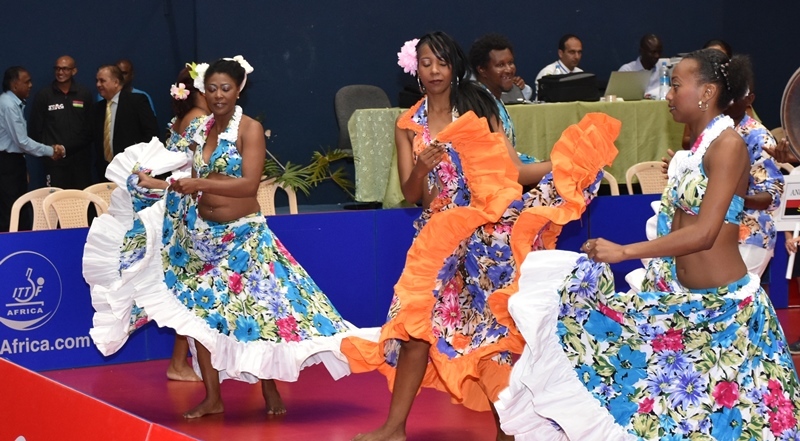 It was the rhythmic swaying of the hips to the pulsating rhythm of the Sega music that kick-started the brief but colourful opening ceremony of the 2018 ITTF African Championships holding in Mauritius. The table tennis family led by ITTF President, Thomas Weikert; CEO, Steve Dainton; Executive Vice President, Alaa Meshref; ATTF President, Khaled El-Salhy and ATTF Council Members as well host nation led by the Mauritius Minister of Youth and Sports, Jean Christophe Stephan; President of Mauritius Table Tennis Federation (MTTA), Vimal Basanta Lala and President, Mauritius Olympic Committee (MOC), Philippe Hao Thyn Voon HA SHUN were all present at the ceremony which welcomed teams and dignitaries to the Indian Ocean nation. The event was opened with the gown flowing Sega Dancers, which is a dance which originated from the ritual music of Madagascar and the mainland of Africa, and it is the Musical Expression of the Mauritian Way of Life: Joy and Liveliness. The Sega was originally sung by men and women who had been sold as slaves but whose souls had remained sensitive to music, the Sega is nowadays a folksong which has integrated itself within the framework of Mauritian folklore. It is usually sung in Creole (mother tongue of Mauritians). With the use of the traditional instruments such as the “Ravanne”, “Triangle”, the “Maravanne” and the traditional guitar was also used. The visitors were treated to an exciting dance steps by the performers to give a feel of the tradition of Mauritius. Welcoming delegates and teams, MTTA boss, Vimal Basanta Lala, described the hosting of the tournament as a unique honour to Mauritius while thanking ITTF and ATTF for their supporting in making the staging of the Africa’s showpiece a reality. He urged the world table tennis ruling body in their efforts to building a table tennis training centre as the first in Sub-Saharan Africa. For the MOC helmsman, Philippe Hao Thyn Voon HA SHUN, ITTF should be lauded for their effort to uphold good governance and their vision in developing the sport in Africa. ATTF boss, Khaled El-Salhy described Mauritius as a good host with their warm hospitality which continues to attract tourists to the Island. He thanked the Mauritius government for their support in staging the tournament. ITTF President however commended MTTA for their efforts in putting the tournament together while reaffirming the world body support to Africa. “ITTF is ready to help Africa and that is why we are looking to support with equipment, coaching and uphold good governance in the sport,” he said. In his remarks, the Minister of Youth and Sports in Mauritius, Jean Christophe Stephan thanked ITTF for considering the country for the hosting of the tournament while pledging the government support to table tennis. He lauded the MTTA for their vision in developing the sport. A ceremonial match was also played between the ITTF President and Mauritius Minister of Youth and Sports to the admiration of the dignitaries present at the event. In the matches concluded on Monday September, Nigeria became the first team to qualify for the semifinal of the men’s team event after beating Congo DRC and host – Mauritius. The trio of Segun Toriola, Bode Abiodun and Olajide Omotayo walloped their opponents to become the first team to step into the last four of the competition. Also, Egypt did not hide their intention to return to the World Team Cup after their disastrous outing at the 2018 edition in London as the North African side needs to complete their 100 percent record in Group Two when they take on Madagascar in their last group match. The Ahmed Saleh-led team pounded Seychelles and South Africa 3-0 to be topping their group. The battle for top spot in Group Three is between Algeria and Togo after both teams won their group matches to set a final group showdown to determine the leader of the group. In the women’s event, Egypt has already berthed in the last four, but Nigeria will have to overcome Algeria in Group Two to know their fate of making it to the last four.